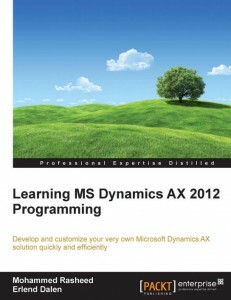 Develop and customize your very own Microsoft Dynamics AX solution quickly and efficiently About This Book Structured learning for new developers and technical consultants Concise and easy-to-follow walkthroughs of X++ code Examples and key tips on how to avoid potential pitfallsWho This Book Is For If you are a .NET or Java developer who wants to develop and customize Dynamics AX 2012 R3, this book is for you. Some experience with object-oriented development technologies is expected, but no experience in development with AX is required. In Detail This tutorial has been carefully structured to guide you through the basic features of AX development and get you started as quickly as possible. With this book, you will soon be able to develop and maintain comprehensive management solutions to enhance your Dynamics AX 2012 application’s performance. Starting with a tour of the development environment, you’ll gain a deep understanding of Dynamics AX tools and architecture, before getting to grips with X++ for deeper customization. You will also learn how to search, manipulate, and integrate data. menu items, menus, and navigation pages. The book also helps you work with MorphX. By the end of this book, you will have a better understanding of the inner workings of Microsoft Dynamics AX-making your development simpler and faster, and your applications fast, reliable, and robust.